There sure are a lot of Elf Haters out there … It’s kind of baffling to me. 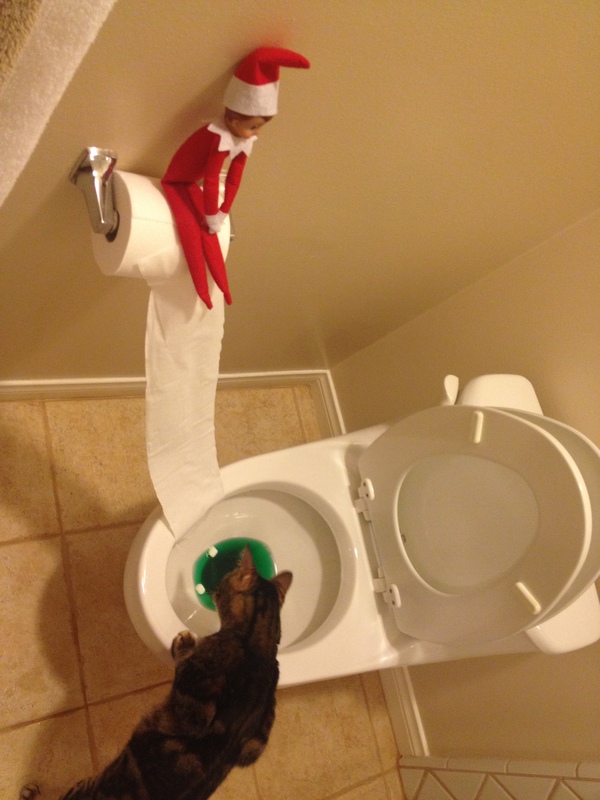 And also slightly amusing that my posting elf pictures to social media sites creates such a strong reaction in people. I guess it’s the part of my personality that wants to keep poking you when you ask me to stop poking you. I’m not hurting you, but it bugs you & seeing your anger rise gives me a sick, twisted thrill. I’m evil. I love the magic of Christmastime, this we already know. I enjoy it even more so these days because The 4-year old Boy is wide-eyed and imaginative when it comes to discovering the intricacies of this holiday. Believing in Santa is fun. It’s a choice. I still believe — not in a big fat smoker who breaks into your home to leave you gifts in the dead of night, but I believe in the spirit of Santa Claus: spreading joy and happiness to friends, family & strangers even. It’s nice to be nice. 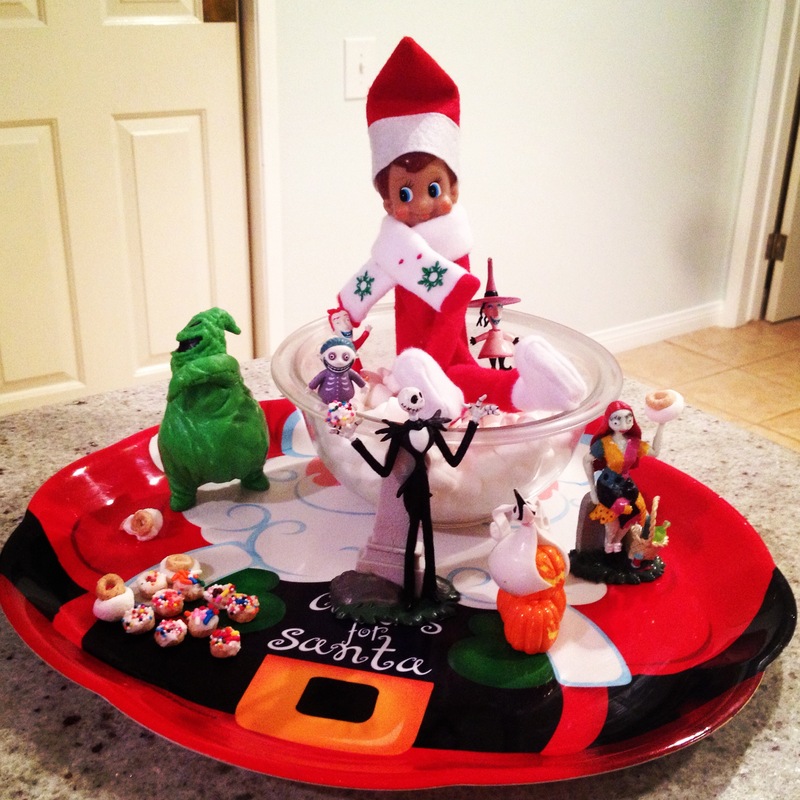 So why are a big chunk of my, (mostly childless,) friends so scrooge-like when it comes to this little elf? 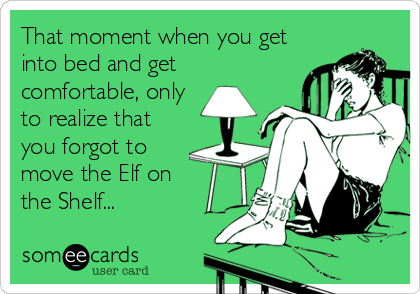 The Elf On The Shelf has caused a big divide amongst friends – you’re either Pro-Elf or Anti-Elf, and it has spurred on many a facebook post/rant. It’s funny to me, too, that the majority of the friends who are so irritated by the elf are the same ones who will post political memes ad nauseam for months leading up to an election. I don’t (usually) whine about it, rather, I quietly remove them from my news feed. They are my friends, after all – I like them for many other reasons besides their backassward political views – and they are free to post whatever they wish on whatever social media platform they choose. 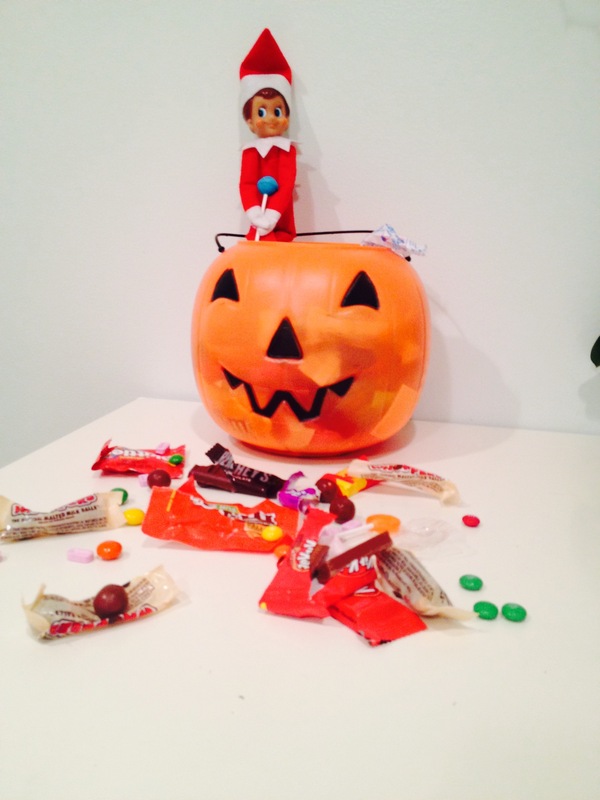 And I’m free to post what I want, too … like pictures of our elf, Kermin!! 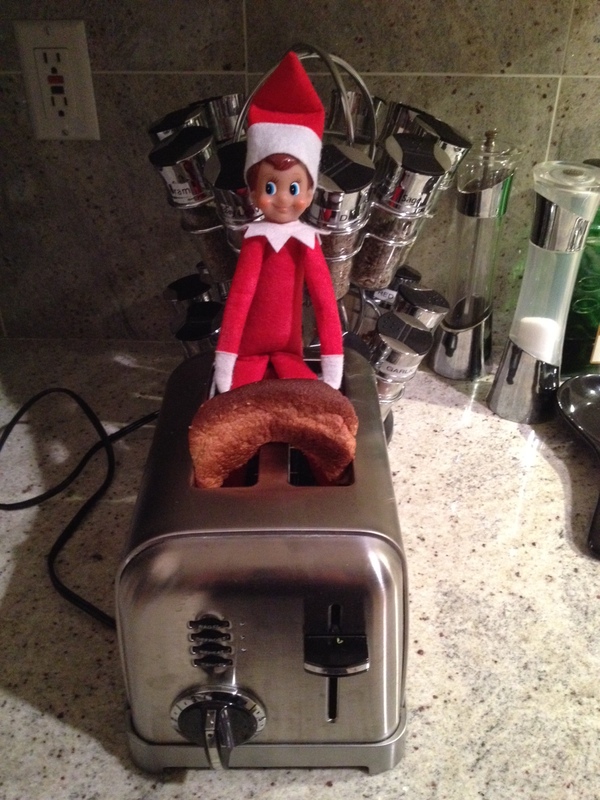 So, bring on the elf! 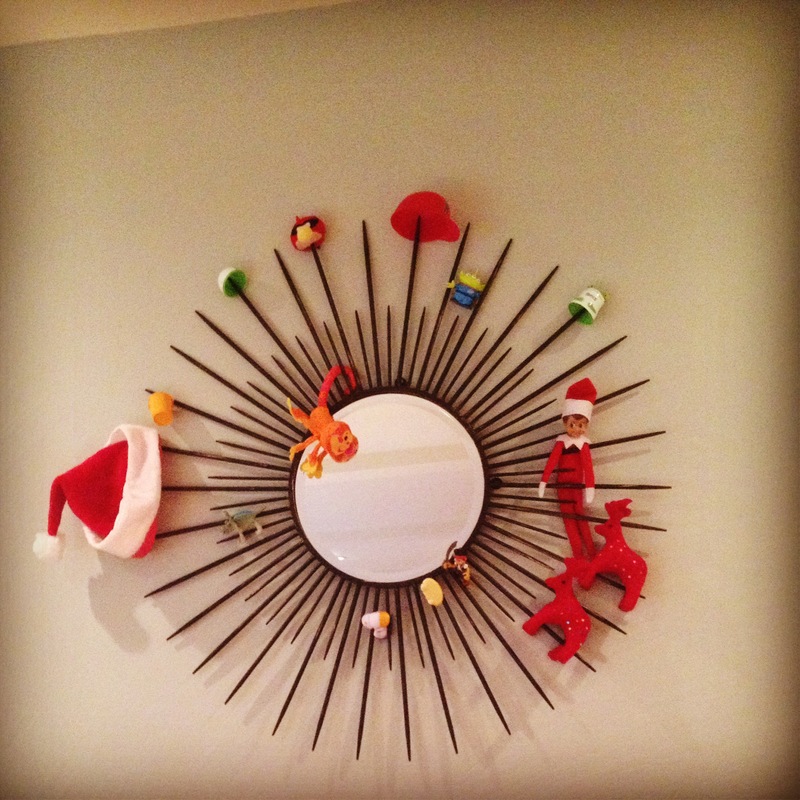 I love this guy … another Christmas character to amuse the little one & feed my creative appetite. I will admit that there are nights where I feel like it’s just another responsibility, another christmas chore that needs to be handled. But usually I look forward to conjuring up some fantastic scene that The Boy will just go nuts over when he wakes up the next morning. I do it all (ok, mostly all) for him. One thing a friend of mine suggested is that the elf be a “kindness” elf & give the kids tasks to complete that involve doing kind deeds. 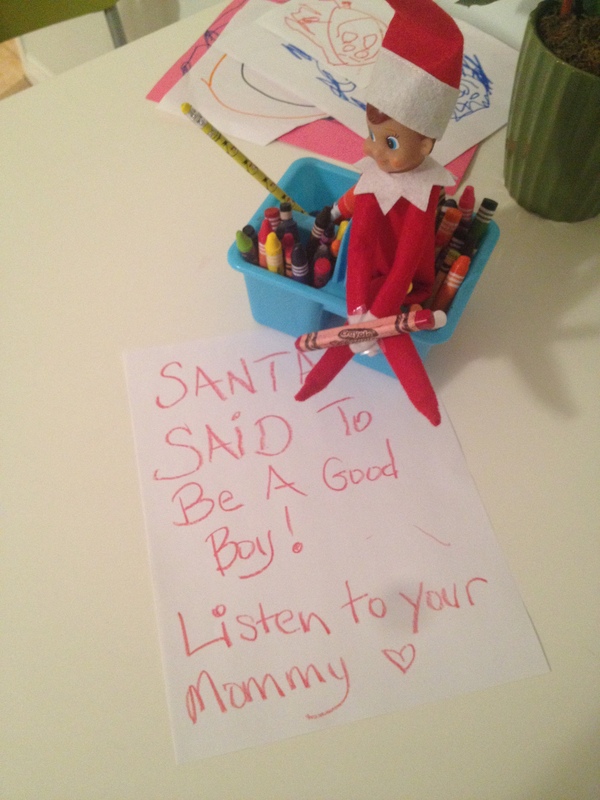 I like that & tried to incorporate it into our elf experience this year sending notes from Kermin to The Boy. 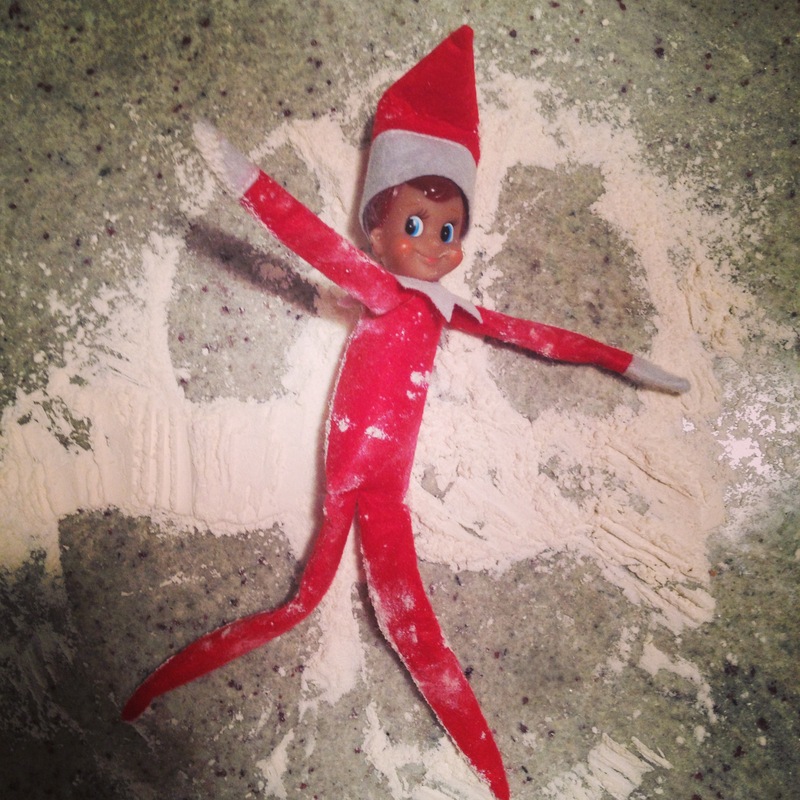 I don’t think that the elf should be evil or naughty – I’m trying to teach The Boy good manners & destroying my kitchen to make cookies is not good manners! Kermin is an elf who is a lot like The Boy: kind, funny, silly, and always up for playing with friends. 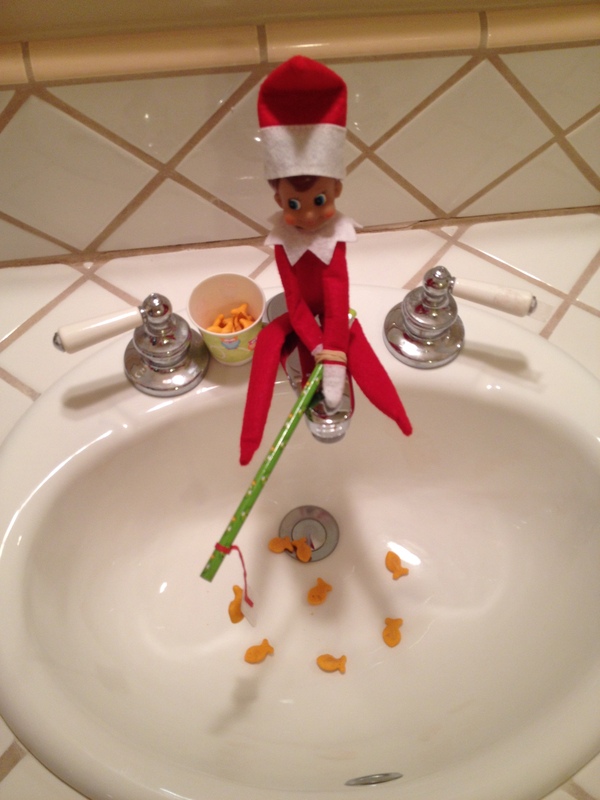 As The Boy gets older, I can see myself doing more sinister elf set-ups – another friend of mine does this with her teenage boys & it’s pretty hysterical. Found the stash of Halloween candy & sampled one of each!! 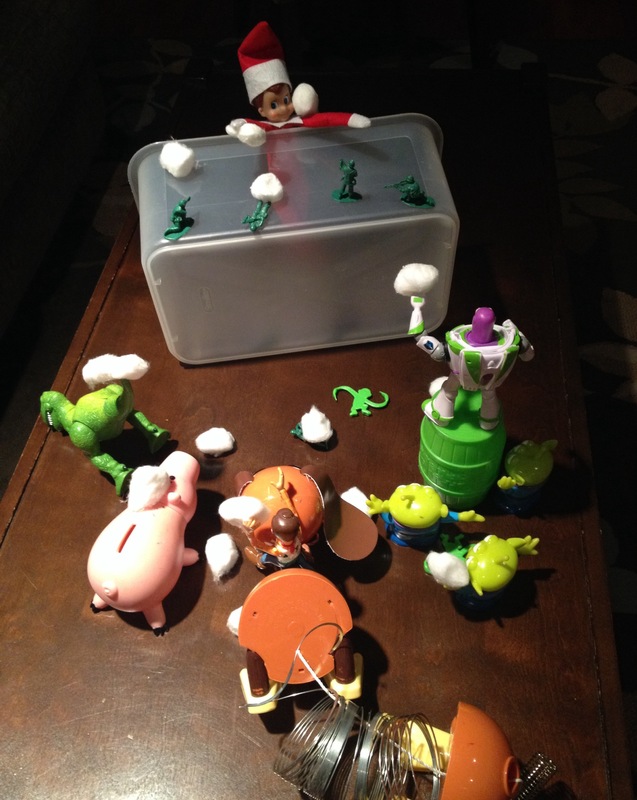 Snowball Fight with the Toy Story Crew! The gang from Nightmare Before Christmas came by with Elf Cookies! So tell me … how can someone be annoyed with something so fun? I’m reminded of one of my favorite Christmas characters, Rudolph the Red-Nosed Reindeer. 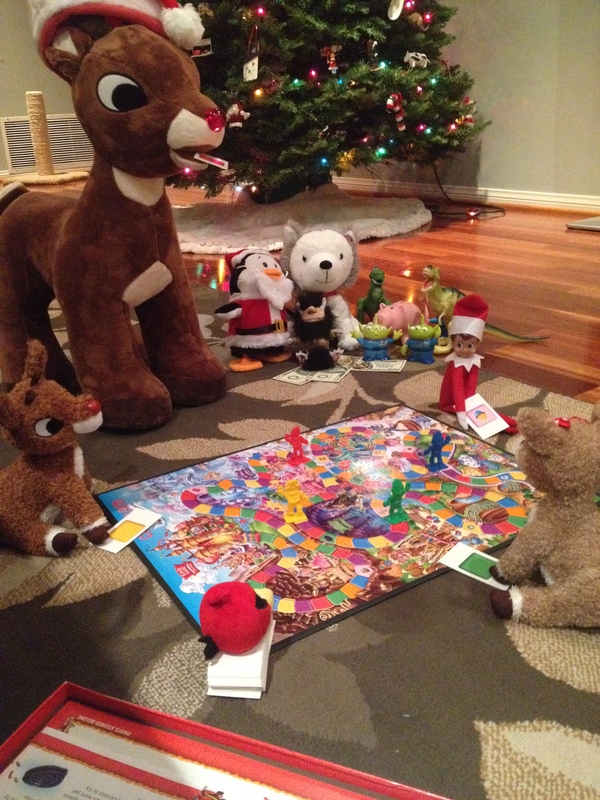 At first, the other reindeer didn’t like him & wouldn’t let him play. Awa – how sad. So people, don’t be a hater, it’s no fun … instead spread a little cheer this Christmas & find it in your hearts to enjoy this little elf and his elfkin games.